I can’t believe it’s March already. And Nora is six months already. I mean, really, she’s sitting. And getting ready to crawl – which will truly keep us on our toes. I don’t even know if I’m ready for that level of parenting: outlet covers and baby gates and oh my goodness she was just here a minute ago! It seems like only yesterday we were walking up and down our street trying to encourage contractions and then meeting her for the first time, in awe of tiny fingers and itsy-bitsy toes that were impossibly perfect. Laughing at how she showed everyone by coming out an Eleanor and not a Carter. And somehow, it’s six months later and she’s a whopping 16 lbs, with two teeth, eating pureed beets and broccoli, and able to sit on the floor behind me and play with toys while I write this first entry on my new blog. Who would have thought that I would miss the 6 hour evening marathon nursing sessions? I know, I know – this is only the tip of the iceberg, and, yes, nearly everyone I spoke with while pregnant warned me about the bittersweet joy of watching a child grow up. But, that pang has been a bit hard to ignore lately. Especially after last Sunday, when we threw a little half birthday party for her. 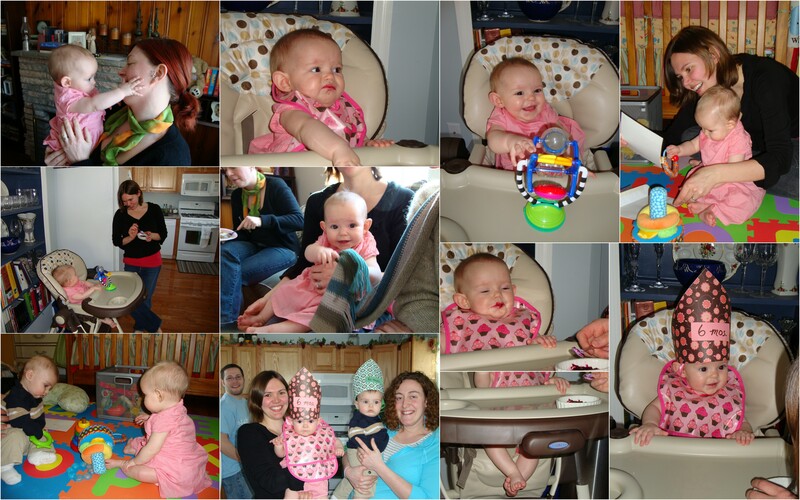 It was the perfect get-together to wear goofy party hats, inaugurate the highchair, try her first solid food (beets, yuck! ), and hang out with some friends. and watching her jump like crazy in her jumper. Something I did more often than not since the beginning of the month. I have to say, it’s a good thing I actually enjoy my job. If I didn’t, I don’t know how I would handle the separation day after day after day. That was the choice we made, though, when we decided to have her now (and, boy, am I glad we did). I knew I would have to work instead of being a stay-at-home mom like I had always envisioned. But I wasn’t, and still am not, prepared for how hard it is to know that I’m missing such a big part of her day and life. What makes this month even more challenging is the looming thought that Chris might lose his job. The deal fell though for his boss to purchase the restaurant, so George gave his two weeks notice. It’s all up in the air, now. Will Chris still have a job when George leaves? Or will they hire a new chef who will want to clean house and start fresh? If he keeps his job, what will that mean for his daily duties and time commitment to Painter’s? That’s life I suppose – always throwing curve balls. I just never imagined that I would be the one with a steady job to pay the bills. So, with the beginning of the month unexpectedly pouncing on us, I decided to start a new blog. It’s for our family who want to see picture and hear updates, but it’s also for me; a place to work out my thoughts and emotions as Chris and I work to get our life where we want it. Hopefully, this will be the kind of story that comes in like a lion, but goes out like a lamb.